If you’ve been struggling every year with keeping your lawn green and growing and your flowers and shrubs fresh and blooming irrigation system installation is one of the best ways residential and business property owners can achieve the lawn and garden results of their dreams. Irrigation system installation will keep your lawn and plantings in top shape from season to season in the harsh New England climate that can feature dry, hot summers that can crisp up a lush lawn in just a few days. 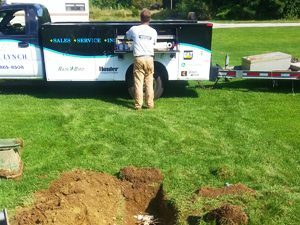 A professionally-installed, in-ground installation system will not only protect and nurture your lawn, it will also increase the value of your property. If that sounds like a great idea to you, then irrigation system installation from Mike Lynch Enterprises is the answer to your irrigation problems. A irrigation system installation from Mike Lynch Enterprises features an automatic residential lawn irrigation system installation that will enable you to grow and maintain a lush green lawn, beautiful shrub and flower beds, and attractive trees with minimal effort on your part. Installing an automated irrigation system enables you to provide your lawn and garden beds with consistent, effective watering delivered at an optimal rate to maximize plant hydration and minimize waste and loss. In fact, a residential irrigation system installation can reduce water loss through run-off and evaporation as much as 50 percent over hand-watering. A properly-designed and installed irrigation system installation provides a variety of benefits. The automated watering timer ensures no more over- or under-watering, with potentially lower water bills resulting from more efficient watering. Using a moisture sensor as part of your irrigation system controller can help fine-tune your watering schedule even more, shutting your system off or turning it on when a certain percentage of moisture is present in the ground. You can even reap additional savings from healthier, longer-living plants and grass that won’t need frequent replacement due to inadequate watering. While some homeowners may attempt to do their own irrigation system installation, hiring a professional irrigation system installation professional to properly design, install, and maintain your residential or business property irrigation system installation is always a good idea. Equipped with the right professional tools and training, a certified and trained home and business irrigation system installation specialist such as Mike Lynch Enterprises can save you time, money, and effort with an efficient, effective irrigation installation designed to meet your exact needs.